And just like that, Thanksgiving has come and gone. Since the calendar gives us an extra week between Thanksgiving and December this year, I'm giving myself permission to slow down a little bit before the Holiday Rush. 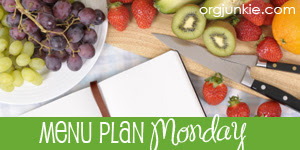 For more inspiration or to link up your own plan, visit I'm an Organizing Junkie.